• Team members appear to be working at 100% capacity - but thei actual progress on project tasks is less than 100% due to non-project related work, which is not accounted for. • Manual or form-based time reporting creates an administrative burden with an overhead cost that far outweighs any benefits. • Reducing administration costs and cutting operational costs by even £1 have a far greater impact on the bottom line than increasing revenue by £1. • Fee-based organisations need to capture billable time quickly in order to speed up the invoice-to-payment cycle. Manual methods and time sheets that do not integrate with project management and billing systems slow down the organisation’s ability to convert fee-earning activity into cash. Time Sheet is a flexible project oriented, web-based time sheet and expense management software solution that integrates with Powerproject. Time Sheet provides team members with the information they need to complete tasks on time, report progress and record expenses. in Powerproject is automatically updated. Extend time reporting to all members of the project team, regardless of location. Time Sheet allows office-based team members and remote users to access, edit and update their time sheets from the office or anywhere in the world. Eliminate paper-based time reporting procedures to enable fee-earners and other professionals to spend more time on project-related/revenue-generating work. Identify how much time employees are spending on project-related work (including overtime), non-project work (e.g. administration, meetings) and non work-related activities (e.g. holidays). Time Sheet is dynamically linked in real-time to Powerproject. All team members using Time Sheet have an up-to-date view of task data and hyperlinks to documents in order to complete their tasks successfully. The responsibility for recording progress against tasks is delegated to those actually doing the work. Employees are directly accountable for reporting progress, which results in faster decision making and improved organisational responsiveness to change. With progress recorded at the point of activity, financial techniques such as Activity Based Costing (ABC) become possible. ABC tracks work at task level and ensures all necessary information about each task is captured. This is vital to services-based organisations for charging time accurately. In addition to resource managers, project managers can review individual assignments that relate to their projects. Reported time is broken down by project, enabling them to reject, approve and apply time reports individually or as a batch. Resource managers assign individuals to tasks via Powerproject. Task details appear within Time Sheet, with related documents (e.g. specifications and task instructions) accessible via hyperlinks. • Users can sort tasks by a variety of criteria and filter by date, helping them manage their time more effectively. • Users can create new tasks, record unscheduled work, overtime, new non-project work, progress and estimate when a task or assignment will be completed. Team members can complete time sheets daily and submit them at the end of each week. • Holidays can be booked and approval requested using Time Sheet. • Time Sheet users can edit their own user information, such as skills and qualifications, to ensure project records are up to date. 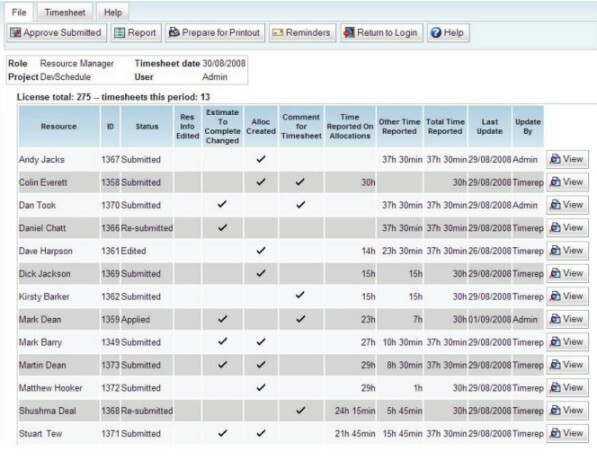 • Managers approve, edit or reject time sheet submissions using the same Time Sheet interface. Rejected time sheet are sent back to the individuals for re-submission. • Once time sheets are approved, they can be applied to the main plan held in Powerproject to automatically update projects, providing an up-to-date view of progress across the organisation. • Time Sheet is set up securely so that team members only view the information for those tasks to which they have been assigned. • Expense claims are entered within the expenses section of Time Sheet. • All expenses can be recorded in Time Sheet – both project and non-project related. • Once submitted, expense claims cannot be altered by the claimant. • The claim can then be approved, rejected or altered by the line manager. • Once approved, the expense claim is then distributed to the finance department for approval or rejection. • If rejected the claim is flagged to the claimant. • If approved the expenses are then recorded against the relevant task in the relevant project in Team Sheet. Time Sheet can be integrated with your billing system so that invoices are automatically generated. All features can be selected or switched off as required during configuration.